For the last four-plus decades, Peter Case has been an “everyman” of American music. He has recorded in a number of styles including punk with the Nerves, new wave with the Plimsouls, plus as a solo artist with some straight rock & roll, blues, folk rock, and solo acoustic performances. His newest release reaches back 20 years. During 1998 and 2000, he twice appeared live on the KPFK-FM syndicated radio program. The 18 live tracks from those performances have been resurrected and comprise his latest release. The two performances are distinct. The first, with a full band, concentrates on his then new album Full Service, No Waiting. The second is more laid back and intimate with only violinist/background vocalist David Perales in support. It is more of a career spanning effort. Full Service, No Waiting may be the best album of his career. and two decades later it is interesting to hear his original live-take on the music. The original album was a folk-rock masterpiece and while it is a little more rock oriented here, the melodies and incisive lyrics are still powerful. The first five tracks duplicate the original release and remain one of the best introductions to his solo career. The second half of the album is more restrained and intimate. Songs such as “Leaving Home,” “Pay Day,” “Beyond The Blues,” and “Coulda Shoulda Woulda” are stripped down to basics. 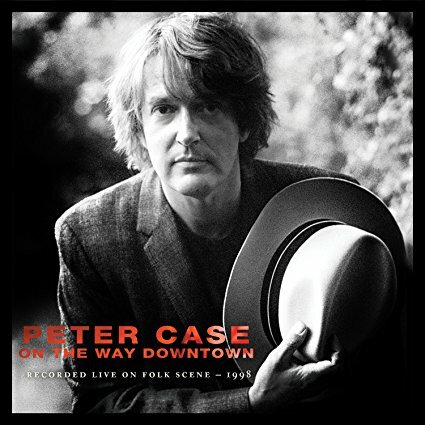 On The Way Downtown: Recorded Live On Folkscene is an excellent peak into the music and mind of Peter Case 20 years ago. An excellent look at a sometimes under appreciated artist.